The CBT-7500 S2 is an easy to use, stand-alone, microprocessor-driven EHV circuitbreaker analyzer. It can operate either in Time-Travel analyzer mode or in Quick- Shot mode (for on-line timing). In Time-Travel mode, the CBT-7500 S2 can fully analyze a circuit-breaker's performance by testing the contact time, stroke, velocity, over-travel, and contact wipe. Contact-motion analysis can be performed for all breaker contact operations (Open, Close, Open – Close, Close – Open, and Open – Close – Open). The CBT-7500 S2's timing window is selectable between 1-second, 10-second, or 20-second periods. The 10-second and 20-second timing windows are ideal for timing long duration events such as circuit-switcher contact testing. In Quick-Shot mode, the CBT-7500 S2 captures the breaker's trip or close time, the trip/close-coil current "fingerprint," and the battery supply voltage while the breaker is still in service. The trip/close time is derived from the time of trip, or close-coil initiation, to the breaker's bushing current-break-or-make as detected by an AC clamp-on current sensing probe. With a simple connection, the Quick-Shot mode can detect a breaker's operating conditions with little or no down time. In Quick-Shot mode, the first trip operation time of the breaker is captured. If a breaker has been in service for a long period of time and sitting in close position, the first trip time of the breaker may be slow possibly due to a sticky mechanism. The Quick-Shot mode is very useful in such cases because traditional breaker timing may not detect this condition since several operations may have occurred before the first timing test is conducted. Conventional Time-Travel Analysis Mode The CBT-7500 S2 is available in models with either 3 (CBT-7500-3 S2), 6 (CBT-7500- 6 S2), or 12 (CBT-7500-12 S2) dry-contact inputs. All models feature three digital travel transducer input channels. Dry-contact input channels are used for timing breaker contacts. Each contact input channel can detect main contact and insertion-resistor contact times in milli-seconds and cycles. One analog voltage input channel, designated as V1, is dedicated to monitoring a circuit-breaker's DC power supply or coil voltage (0 – 255 volts, DC or peak AC). A second voltage input channel, designated as V2, is dedicated to detecting the voltage on/off status (presence or absence) of an A/B switch. A built-in Hall-effect current sensor records the Trip/Close current level and duration. The breaker's operate-coil current waveform duration (effectively, a performance "fingerprint" or "current profile") can be used as a diagnostic tool for analyzing a breaker's performance. Three digital travel transducer channels are available on the CBT-7500 S2 for measuring circuit-breaker velocity, stroke, over-travel, and bounce-back. Unlike other transducer types, the digital transducer requires neither calibration nor setup. A breaker's contactvelocity is calculated based on the contact's travel distance over a period of time. A special feature is also available to "slow-close" test a breaker and obtain a test result report. A built-in solid-state initiate device is used to operate a breaker from the CBT-7500 S2. The operational modes include Open, Close, Open – Close, Close – Open, and Open – Close – Open. Multiple operations, such as Open – Close and Open – Close – Open, can be initiated by using programmable delay time or by sensing a breaker's contact condition. One resistor type input channel is also available on the CBT-7500 S2. This input channel allows the unit to measure circuit-breaker motion by directly interfacing with resistive type transducers. The transducer resistance ranges from 200 ohms to 10K Ohms. The CBT-7500 S2 can store up to 150 test records in Flash EEPROM. Test records can be retrieved and printed on the built-in thermal printer, or they can be transferred to a PC via the unit's RS-232C or USB interface. The CBT-7500 S2 can store up to 99 circuit-breaker test plans. Test plans are comprised of all circuit-breaker performance specifications (stroke, velocity, and contact time). A test plan can be used to immediately test a circuit-breaker. A pass/fail report is then generated by comparing actual performance with the specifications in the stored test plan. Test plans can also be generated on a PC and transferred to the CBT-7500 S2 via the unit's RS-232C or USB interface. 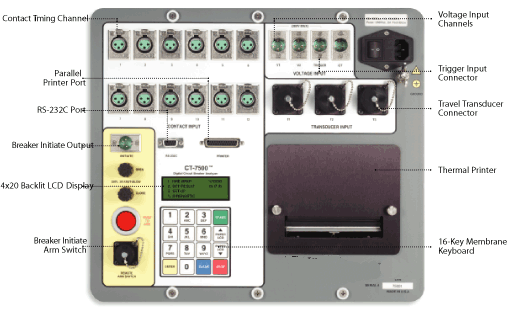 The CBT-7500 S2 can be computer-controlled via its RS-232C or USB interface. A Windows® XP/Vista-based Breaker-Analysis software application is provided with each unit. Using this software, circuit-breakers can be timed from the PC. Test records can be retrieved from the CBT-7500 S2 and then stored on the PC for future analysis and report generation. 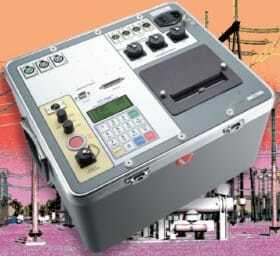 Circuit-breaker test plans can also be created on the PC and transferred to the CBT-7500 S2. Additionally, test records can be exported in Microsoft® Excel format for further analysis. The CBT-7500 S2 can perform diagnostics on its internal electronics. Diagnostics can be performed to verify contact cable connections and to test the travel transducer's electronics. The CBT-7500 S2 features a back-lit LCD screen (20 characters by 4 lines) that is viewable in both bright sunlight and low-light levels. A rugged, 16-key, membrane keypad is used to control the unit. The CBT-7500 S2's built-in 4.5-inch wide thermal printer can print the breaker contact analysis results in both tabular and graphic formats. Do you want to buy high quality Switch testing? Inquire for our Switch testing prices.